Ahh, the Priest project, one yearand stillin the making. But it wouldn't be a project without research doldrums and distractions from other shiny objects. 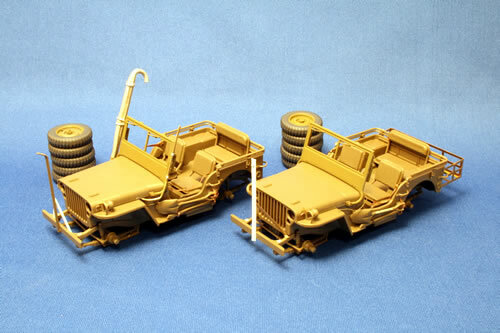 In this case, a pair of Tamiya jeeps: one on the left to accompany Baboon as it enters France, and the other to be used for a subsequent diorama. But I have a review of Voyager Model's extensive photoetch set for the Academy Priest. In his vignette "The Shortest Straw," Martin Dogger sets Tasca's Late Production Sherman bogged down in the Italian mud. We also have Cookie Sewell's review of AFV Club's M5A1 Stuart Late, a welcome addition to the ranks of light tanks. Finally, I've posted some new half-track photos including an M3A1 undergoing restoration at the Fort Snelling Military Museum, and an M16 Machine Gun Motor Carriage at the Victory Museum in Auburn, OH. Happy Holidays and Peace to one and all! We start with a Cookie Sewell review of DML's hot new T19 105mm Howitzer Motor Carriage. I review a figure set from earlier this year, MiniArt's U.S. Jeep Crew and MP, the quintet of GIs that originally came with the company's Bantam jeep. Also, Kurt Laughlin has updated his article on the 7.50-24 Wheel and Tire used by the 105mm howitzer. I've been working on accurately building Academy's Priest as "Baboon" of the 14th Armored Field Artillery Battalion, 2nd Armored Division. This month's article on the "Historical Baboon" examines photos of this vehicle and the questions they raise. As a followup to his July article on tires, Kurt Laughlin's 7.50-24 Wheel and Tire provides info on one of the missing pieces in the tire puzzle, those used on early 105mm carriages. Recognizing there are a lot of new Shermans on the market recently, Roy Chow kindly updates his helpful guide Sherman Variants. It's a simple update this month but one that I think will be of some interest: walkaround (and climb on top of) photos of the M4A3E2 Sherman "Jumbo" at Camp Ripley, MN, and the M3A1 Stuart at nearby Brainerd. Kurt Laughlin does the heavy lifting this month with his article U.S. Army Pneumatic Tires of World War II. The article was prompted by some online discussion of the sizes of tires on 105mm howitzers from DML and Italeri and aftermarket alternatives. "In spite of terrible memories, some American veterans have no problems to recreate WW II battlefields in detail like a model train scenery. In this diorama by US-Army-Models, a convoi moves through Hürtgen Forest in the Eifel mountains, where, from october 1944 through february 1945, the last majorand, from a military viewpoint, most senselessbattle on the Western front was fought. Seen are infantry marching, resting, and sleeping." The caption suggests I am a WWII vet, which is far from the truth! But it was neat that someone reached out to the modeling community to help readers visualize a story. If you haven't looked at the diorama in a while, check out the new pictures. I build and review both DML's 105mm Howitzer M2A1 & Carriage M2A1 and Italeri's 105mm Howitzer M101. No surprise which I like better, but the Italeri kit probably should have gotten more respect during its long run. I'm into the painting and weathering phases on the two Priests. Here's the initial paint scheme for Academy's Priest as it appeared in Sicily. I just received DML's M2A1 105mm Howitzer and it looks like it could be a super build out of the box. I'll let you know next month. Well, I'm bummed to miss AMPS this year, particularly as it was my last opportunity to see the armor collection at Aberdeen Proving Grounds before it is dismantled and reassigned to a new post. Next year, in Auburn! In the meantime, there's still plenty of plastic and resin to build. My Priest saga continues with work on Academy's upper hull exterior. A fine set of six figures for U.S. Half Track Crew from New World Miniatures. Cookie Sewell provides reviews of the new DML M4 Sherman "Composite Hull" PTO and DS Track for Sherman (T54E1 w/EEC) from DML/Cyber-hobby. I'm about halfway through my Academy intermediate Priest and Italeri late M7 Priest. Stay tuned for more! I've been so busy working on my Priests that I've had a hard time pulling myself away from the bench. But I have been writing construction articles for both the Academy and Italeri M7s, and I'll offer an in-progress report next month. In the meantime, this month's heavy lifting is done by newcomer Rod Crisman, who reviews Government Issue: U.S. Army European Theater of Operations Collectors Guide, Volume II, by Henri-Paul Enjames, and DML's U.S. Marines Guadalcanal 1942; and Cookie Sewell, who reports on the new M4 Sherman 75mm Normandy and DS Tracks for Shermans, also from DML. We tend to assume the .50 machine guns included with our models are accurate. But their mounting hardware is often specific to certain vehicles or time periods. Hervé "Charby" Charbonneau makes everything illuminated in this regard with his excellent article on .50 Cal M2HB Mounts: One Style Does Not Fit All! While many resin Sherman hulls feature the prominent foundry markings often seen on the differential cover, most plastic kits lack these features. Archer Fine Transfers has a nifty set of these markings, and Kurt Laughlin provides the background to help you use them with Foundry Symbols and Tradmarks, 1940-1945. Resicast leads the way with unique subject matter, and my examination of their Utility Trailer and Assault Boats shows this kit is no exception. As work continues on my build of three M7 Priests, I also review Warrior's final pair of cold weather M7/M&A1 Priest Crew. I finally got my hands on DML's U.S. Army Tank Riders 1944-45 and it's a very welcome set indeed. Last but certainly not least, I've uploaded a new M3 Lee/Grant page in the AFV Photos section with contributions from Neil Baumgardner and Ian Sadler.